Sourcing quality materials and the services of an experienced installation team is essential if you are planning to buy replacement windows and doors in Midhurst, ON. When you are investing in your home, it is essential that you choose products that will last for many years. These renovations are an investment for your property, helping to boost the comfort of your home and improve property value at the same time. 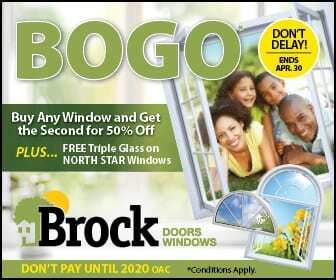 At Brock Doors and Windows Inc, our goal is to provide the best products and services for our customers. We recognize the importance of durability and style. So, we never cut corners on the materials that are installed. If you are interested in learning more about the ways that we can help with your home, then we encourage you to contact our team to schedule a consultation. Why Should You Buy Replacement Windows and Doors in Midhurst, ON? Why is it a good idea to spend your money on new doors and windows? It is important that you remember the investment that is available for your family. Yes, you will be spending money on the materials and installation, there is a long list of benefits that will be gained after we are done with the work. For example, you will notice a difference in the energy efficiency of your home. When the materials have insulating properties, then it is easier to manage the indoor climate in each room. The windows keep the heat inside during the cold winter months, helping to reduce thermal transfer that might impact the comfort of your living space. These details can also affect the appearance of your home as well. If the property looks outdated, then it means that you need to add modern features that will boost the overall appearance. These details can help you set the right impression when other people come to visit your family. The décor updates will be noticed from the street, and you will also see a difference inside as well. Any time you spend money on your home, you need to think about the investment benefits that are available for your family. Even though you need to put money into the materials and installation, you will notice the long-term financial benefits that come from the work. As mentioned above, you will experience a positive impact on your property value. Increasing the value of your home is important so that you have plenty of equity to buy the next property when you are ready to move. The energy efficiency features of replacement windows and doors in Midhurst, ON also have a noticeable impact on your monthly utility bills. As you decrease your monthly spending, you will find it easier to manage your family finances. Some people are fooled into thinking that they don’t have enough money to invest in home renovations. But, when you see the financial benefits that you will be giving up, it makes sense that you shouldn’t delay the decision to upgrade your home. If you are getting ready to start on your home renovations, then it is essential that you have a trusted contractor to assist with the work. There are times when DIY projects might make sense if you are looking for a way to save money. But, the best solution is to hire an experienced team to help with big renovations, such as installing new doors and windows. You can look online to find a contractor in your local area. Choose a team with a history of experience in the area. Not only do you need someone who understands the local climate, but you also need a contractor that ensures the quality and durability of the materials that are installed. Hiring a good contractor is the most important decision that you can make to protect the quality of your home. When you find a contractor that you are interested in hiring, then the next step is to schedule a consultation to learn more about the services. This consultation can happen in the showroom where you can view the materials and designs that are offered. Or, you can also set an appointment in your home. During the meeting, you should feel comfortable to ask questions and learn about your options. Education about the industry is essential so that you pick the materials that are the right fit for your family.